ZTV or ZVI analysis is the process of determining the visibility of an object in the surrounding landscape. The process is objective in which areas of visibility or non-visibility are determined by computer software using a digital elevation dataset. The output from the analysis is used to create a map of visibility. A ZTV/ZVI map illustrates the potential (or theoretical) visibility of an object in the landscape. The phrase "potential visibility" is used to describe the result because the analysis does not take into account any landscape artefacts such as trees, woodland or buildings etc. The analysis is made on the basis of topography alone. The results are not intended to show the actual visibility of an object, they are intended to indicate where the object may be visible from. Actual visibility can only accurately be determined by site survey since there are a multitude of local variables that may affect lines of sight. On the other hand, a ZTV/ZVI does show where an object definately cannot be seen. This is of great help when planning fieldwork because the surveyor knows where there is no need for a "ground truth" check and can focus efforts where there may be views. Simple ZTVs can be used at early stages in the study to make site visits more efficient. 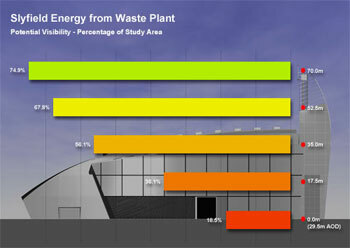 Figure 1 shows the potential visibility of various points on a proposed building, expressed as a percentage of the study area. For example, the highest point has potential visibility from 74.9% of the study area. The acronym "ZVI" stands for Zone of Visual Influence although it is sometimes referred to as Zone of Visual Impact. The term "Influence" is more often used because "Impact" is thought to sound rather prejudicial for what ought to be an objective study. Other terms for this form of visibility analysis are also in common usage. 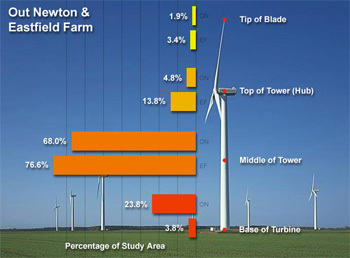 Recently, and particularly since the publication of Visual Representation of Windfarms: Good Practice Guidance by Scottish Natural Heritage in 2007, the term "Zone of Theoretical Visibility" (ZTV) has become very popular and is now the preferred term for describing this type of analysis. ZTV refers to the fact that areas of visibility determined by the algorithm are only theoretical because there may be visual barriers (buildings, woodland etc.) in the landscape that will screen the object under consideration. ZTVs are often used as part of a Landscape and Visual Impact Assessment (LVIA), which may form part of an Environmental Impact Assessment (EIA). The term "Visual Envelope Map" (VEM) is also commonly used as a generic term to describe a map that shows the extent of visibility of an object. However, it is important to make the distinction between the generic meaning of VEM and the more specific "Visual Envelope Mapping" which refers to the pre-computer method of the determination of visibility of an object in the landscape. This is a field method where an observer stands at the object location and draws a map of those parts of the landscape that can be seen. Assuming inter-visibility between the observer's viewpoint and the areas that are visible, a map of visibility can be created. Naturally, such maps are subjective and may vary with different observers and in different environmental conditions. The generic terms "Viewshed" and "Viewshed Analysis" are also sometimes used to describe the determination of visibility of an object in the landscape. Throughout this document, the term "ZTV" is used to mean both ZVI and ZTV. The ZTV map is compiled from the results of an analysis of a Digital Terrain Model (DTM). Prior to the analysis, this DTM is created using digital elevation data. The data may take a number of forms but most commonly it is a combination of contours and spot heights. A number of datasets are available from the Ordnance Survey (OS) and (increasingly) from other bodies. Datasets should be chosen carefully because they all have different resolutions and accuracies and there may be a marked difference in cost. It is important to choose a dataset that is appropriate for any particular project. Currently, the most commonly used dataset for ZTV analysis is OS Land-Form PROFILE Plus. This dataset provides contours and spot heights which are derived from the OS 1:10,000 sheet series. Contours are at 5m intervals and are accurate to ± 1.0m in rural areas and ± 0.5m in selected urban areas. This level of accuracy and resolution is "good enough" for most studies and is reasonably economical. 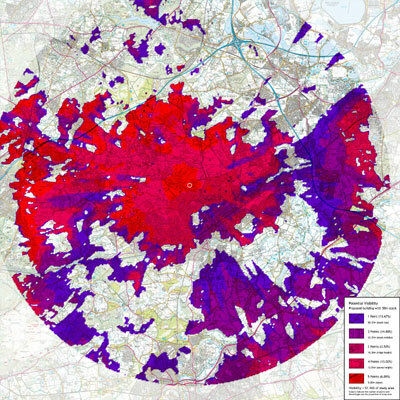 A typical study area may have a radius of between 10 and 15 kilometres and coverage for such an area using Land-Form PROFILE Plus will cost in the region of £200. Recently, higher resolution and higher accuracy datasets such as NEXTMap Britain have become available. Improved Global Positioning Systems (GPS) have enabled airborne technologies such as RADAR and LIDAR (Light Detection and Ranging) to be used to gather very high accuracy elevation data (+/- 15mm in the case of LIDAR). However, these datasets are costly and are currently uneconomic over the large areas required for meaningful ZTV studies. The method for determining the visibility of an object in a DTM will vary depending on the type of software being used. There are two common methods; one known as the "Inter-visibility Method" and a second known as the "Radial Line" method. This method works by checking the inter-visibility between the object location and a matrix of points, arranged at regular intervals, across the study area. Each point within the matrix is assigned a value of 1 or 0 depending on whether it is visible or not. The binary data may be presented in a number of ways but commonly, each value of "1" may be represented by a coloured square on a map and thus a map of visibility may be created. This method is a little more complicated but it can result in a higher resolution result. It works by generating many radial long-sections from the object location to the limit of the study area. Along each section, lines of sight are used to determine which lengths of the section are visible and which are not. 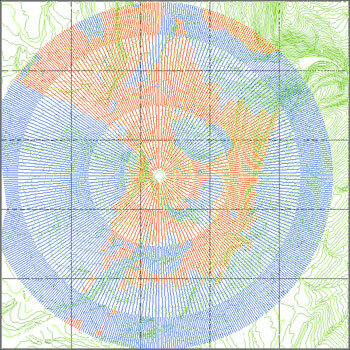 The output from this method is in the form of a radial line map where the radials are colour-coded so as to represent areas of visibility and non-visibility. Figure 3 shows the result of an analysis where red radials represent areas where the object may be seen and blue radials show where the object definately cannot be seen. Both the methods described above will also include corrections for the curvature of the Earth (DTMs assume a flat Earth) and atmospheric refraction (the bending of light as it passes through the atmosphere). Both of these corrections are important because they can have a significant effect over the sort of distances studied in the ZTV process. The methods described above can be used to determine the visibility of a single point in the landscape. Although single-point analysis may be appropriate in some circumstances, it is much more common to use a multi-point analysis to describe the visibility of a building or other complex object. Single-point analyses have one serious drawback; they result in binary output, in other words, we can only say that a point is either visible or it is not. For more complex objects like buildings, it is desirable to have some sort of measure of visibility. If the output is quantitative rather than purely binary, it is possible to assess the degree of visibility of an object. In order to create such a result, it is necessary to run a number of single-point analyses from different point locations and to compile the results into a single output with visibility described on a numeric scale from 1 to X, where X is the number of points studied. This process is known as multi-point analysis. An additional benefit of multi-point analysis is that it may be possible, using a judicious arrangement of points to describe the degree of visibility of different parts of a building. For example, a simple building with a pitched roof could be analysed using 3 points; one at ground level, one at eaves level and one at ridge level. Once the analysis is complete, it will be possible to determine from which parts of the study area the whole building may be visible and those parts where only the roof may be visible. Figure 4 shows an arrangement of points designed to model the visibility of a wind turbine. From what has been said, it is clear that the multi-point ZTV can be a very powerful tool in determining the degree of visibility of complex objects. However, it is very important to design an arrangement of points that will answer all of the questions that one may have about the visibility of an object. In some cases, more than one multi-point study may be required. Good study design involves careful thought about the position of every point used. Since points may be placed anywhere within the study area, this method is not confined only to the analysis of single buildings. A thoughtful arrangement of points can be used to model the visibility of residential developments, roads, quarries etc. Some practitioners prefer to present ZTV data that attempts to present a more "accurate" picture of actual visibility by including visual barriers within the analysis. The difficulty with this approach is that it inserts an element of subjectivity into what ought to be an objective study. For example, if it is decided to include areas of woodland as visual barriers, a subjective (and sometimes arbitrary) decision about what constitutes "woodland" must be taken. There must also be an estimate of the average height of that woodland. Even if every care is taken to accurately classify and model woodland, the effectiveness of woodland as a visual screen may vary with the seasons. In many ways, such a study is misleading because it gives the impression of being more accurate when, in fact, the decisions about whether a visual barrier should be included or not and the effectiveness of that barrier are based upon a set of parameters which are, at best, notional. By contrast, the "topography only" or "bare earth" ZTV illustrates an objective, unambiguous and easily understandable picture of visibility with nothing filtered out. This allows the user to interpret the data knowing that they are being presented with a complete picture. One of the best ways to express what such a ZTV shows is to say that it represents the "worst case". In other words, it shows what the visibility of a development in the landscape would be if there were no visual barriers. The advantage of this approach is that it allows individuals to use their own judgement when interpreting the details of the combined mapped data and base mapping. Since the ZTV map is always presented on a suitably detailed map base, the information can be easily interpreted. 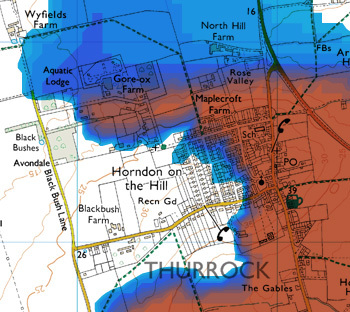 The map base shows where there are visual barriers such as areas of woodland or urban development and from this, a better understanding of the actual visibility may be determined. Figure 5 shows a detail from a multi-point ZTV overlaid on an OS 1:25,000 map base. Despite what has been said about the use of visual barriers, they can often be useful, particularly in the testing of visual mitigation measures such as screen planting or mounds/bunds. Using visual barriers to represent these features, it is possible to test the effectiveness of such measures. This method can be very helpful in the design of visual mitigation measures and may be part of an iterative process. ZTV analyses are run using specialist software. Commonly, this is either AutoCAD plus an add-on such as Key TERRA_FIRMA or GIS software such as Global Mapper. The analysis process can take some time to complete and is dependent upon the number of points/triangles in the DTM, the number of study points and the resolution of the study. For complex studies over large areas, the process may take many hours or even days. The output from a multi-point analysis is in the form of a digital information model of the study area where the X and Y values of points represent their plan location but where the Z value represents the number of points seen. Essentially, this information model (also known as a visibility model) takes the same form as an elevation model. The only difference is that Z values represent the number of points seen rather than the number of metres above ordnance datum (AOD). In order to present this data in map form, a further analysis is required. The visibility model is subjected to an elevation analysis and this produces a map of Z values. Since Z represents the number of points seen, the resulting colour-coded map shows where different numbers of points can be seen. This gives a good impression of the degree of visibility of the object (or objects) across the study area. Finally, the mapped data must be presented as an overlay to some appropriate base mapping. Most commonly, OS 1:25,000 raster mapping is used because this gives the most detail at a reasonable scale. Even if the final output will be printed at 1:50,000, it is better to use a reduced version of the 1:25,000 mapping than to use the OS 1:50,000 mapping. Currently, raster mapping coverage for a typical ZTV study will cost in the region of £300. Mapped data and base mapping are usually combined using Adobe Photoshop software. This can also be used to add a legend, scale bar, north point and title-block and to the finish the drawing to a print-ready state as shown in Figure 6. A ZTV analysis is a useful desk study that may help to clarify the potential effect of new buildings in a landscape but it is not an end in itself. In order to get closer to a good understanding of actual visibility, the results of the ZTV must be tested on the ground. Site survey work will establish whether local conditions cause areas of potential visibility to become areas of actual visibility or not. For more information on ZTVs and their part in LVIA, see Guidelines for Landscape and Visual Impact Assessment (Third Edition), published by The Landscape Institute and the Institute of Environmental Management & Assessment (2013). All the ZTVs on this page were created by David Watson using AutoCAD, Key TERRA-FIRMA and Adobe Photoshop.